Super Bowl XLVII will see the Baltimore Ravens and San Francisco 49ers battle it out for the Vince Lombardi Trophy this year. The 49ers beat the Atlanta Falcons in the Georgia Dome, 28-24 to become NFC Champions. The Falcons started the game fast and furious, with receiver Julio Jones catching 11 passes for a postseason record 186 yards and two touchdowns. But, the Falcons were weak on the ground and the 49ers weren’t, with Frank Gore rushing for 90 yards and two touchdowns. 49ers quarterback, Colin Kaepernick, was 16-for-21, connecting five times with tight end Vernon Davis for 106 yards and a score. It was nice to see Davis contribute so greatly after having a relatively quiet season. Randy Moss got in on the action too, with three catches for 46 yards. Falcons QB, Mat Ryan, was 30-for-42 and a whopping 396 yards and three touchdowns. He fumbled once, and threw an interception. Tight end Tony Gonzalez, who has previously eluded to this being his last season playing in the NFL, finished the game 8-for-76 with one touchdown. In a post game interview, he indicated again that is likely his last hurrah, and mentioned he didn’t even want to take his uniform off. While Gonzalez was somber with a face full of sorrow, Baltimore Ravens linebacker Ray Lewis, who has confirmed his retirement was celebrating his team’s win as they advance to the big game. Yes, the Ravens emerged victorious over the Patriots with a final score of 28-13. I never got the feeling that the Patriots were completely tuned in to this game. Tom Brady threw 29-for-54, 320 yards, one touchdown and two INT’s. Of course, Wes Welker got his licks in on eight catches for 117 yards, but the team’s overall performance was subpar — for them. On the other hand, the Ravens carved out a more deliberate performance. Joe Flacco turned in three touchdowns after throwing 21-for-36 and 240 yards. Running back Ray Rice had a rushing touchdown, tight end Dennis Pitta hauled one in, and WR Anquan Boldin caught two TD’s. The Ravens defense, who truly played like a unit, was responsible for a forced fumble and two interceptions, and controlled the Patriots offensive efforts. This loss marks the first time the New England Patriots ever dropped a game at home in an AFC Championship game. Also for the first time, this matchup will feature two brothers, John Harbaugh and Jim Harbaugh, meet in the Super Bowl as head coaches. 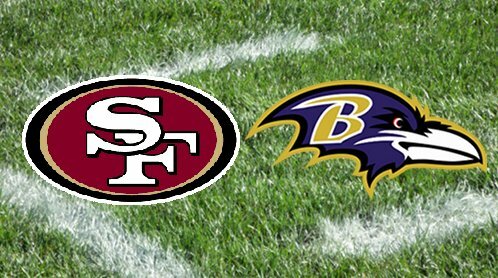 The 49ers and Ravens will compete in Super Bowl XLVII February 3, 2013 at the Mercedes-Benz Superdome in New Orleans, Louisiana. Kickoff is at 6:30 PM ET, on CBS. Promises to be an entertaining Super Bowl, filled with subplot after subplot after subplot. I’m still disgusted at Atlanta. 17-0 lead at home and nobody can stop Julio Jones and you try to run the ball and score no points in the second half? Donchristop, I am definitely looking forward to this game. You are right about the subplots. The Harbaughs, Ray Lewis, Kaepernick, Alex Smith, Ed Reed, Patrick Willis, Randy Moss, Ozzie Newsome, OJ Brigance, etc., etc….. As for ATL, yes, they blew it. They had the momentum, but didn’t stick to the recipe that was working.